Unbeknown to me, the last game turned out to be my 1400th game of football that I had ever seen. It was only later in the week that I discovered this fact when I updated my total games spreadsheet after reading a topic on a forum. I certainly would have chosen something more special than Newport Pagnell Town if I had known beforehand. No disrespect to them, they are a perfectly fine club and I enjoyed my night there, but this match was chosen purely out of convenience as there were plenty of backups nearby, a fact that I had to consider due to the terrible weather conditions that had seen games called off. 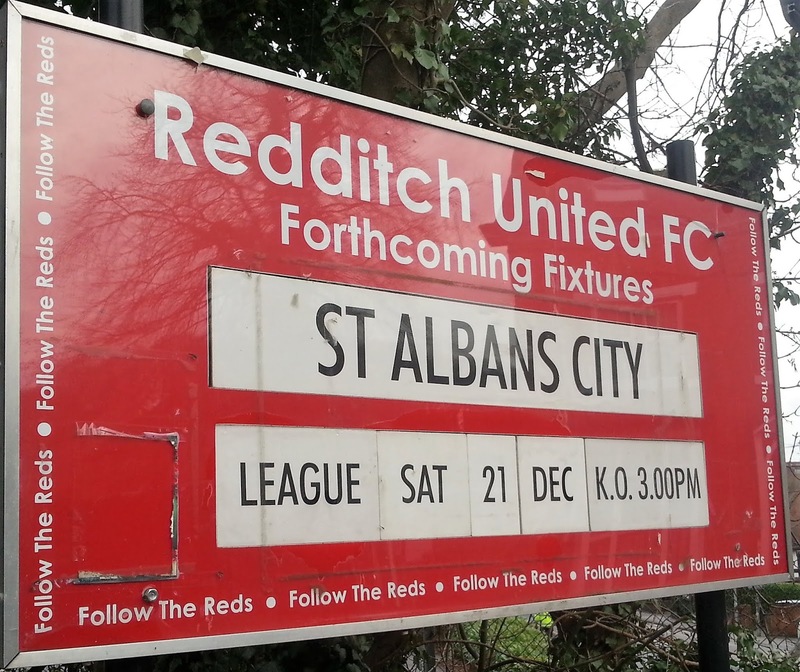 Not much happened in the week in between then and this game, but we already knew on Tuesday that Redditch would be our destination. After doing a step 5 game on Tuesday, I wanted to get one higher up the pyramid ticked off and this one appealed. Not only is it at one of the highest possible steps at which I can go to, but there was also talk of them moving ground in the near future. I didn't want a situation like with Cambridge City where I ummed and arred and ended up not being able to see a game there before it closed. I was actually thinking of going to see Bristol Manor Farm on Friday night, but Anwar was not too keen, despite thoroughly enjoying watching them play at Melksham last month. I certainly wasn't going to go on my own, not when I could work and earn myself nearly £50 for little over 3 hours work. So that one went by the wayside, and match 1401 would have to wait until the following day. I had more work the following morning, this time £28 worth and so I decided to leave early and offset it against my football costs for this season. I left at 10.30 and after 2 hours work met Anwar at 12.30. He had an additional passenger in the shape of his daughter Aisha who had also come to watch Royston Town v Biggleswade Town with us last season. We made slow progress towards the M40 thanks to over 20 miles of single track road up to Bicester. When you are on these sort of roads, you are stuck at the speed of the slowest vehicle on the road when you are in a long line of cars, and boy were some people dragging their heels today. We sped up a bit once we got to the M40 and then the M42, and arrived in Redditch just after 2PM. With all of us hungry, we made our way into town, just under 10 minutes away. The ground was excellently located and had I known, I would have left a lot earlier and spent some proper time in town. We went to the Brittania Chippy, an Asian owned place, which did all sorts of nice stuff. I settled for a Sheesh kebab stick, a samosa and chips which came to £3.40. It was pretty nice too, not the best, but better than average. We then made our way to the ground, arriving about 2.45. I went and got my stuff from the car, and after paying to get in, bought a programme. It was pretty well presented but didn't have a huge amount to read though. First port of call was the club shop, which looked good, but didn't have any pens or pennants for me to buy. I then updated my Facebook before taking some pictures of the ground and then finding a seat behind the goal for the first half. I had seen St Albans on 3 previous occasions. Firstly at their own ground in 1999 when they faced West Ham in a testimonial for their long-serving player Steve Clark. West Ham played a young team that day but still triumphed 5-0 with Gary Alexander getting all of them. He went on to have a reasonable lower league career, which was a bit less than his performance that night suggested. 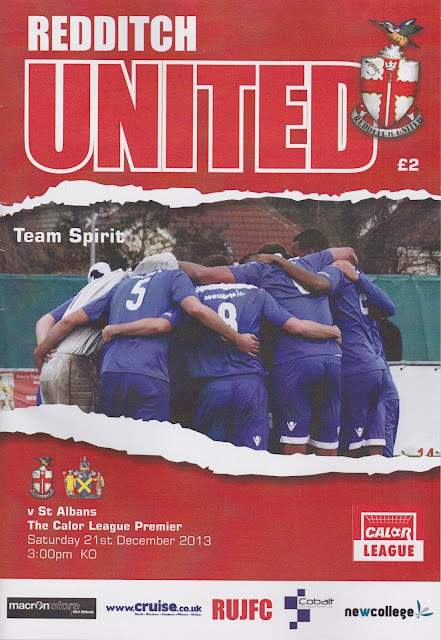 I had also seen them triumph 3-0 at Slough a year later, and then in 2005 get a 1-1 draw at Enfield Town in the FA Cup. I had only seen Redditch on one previous occasion. As recently as last season they were beaten 3-0 at Arlesey in a very one-sided game. One notable player in the St Albans lineup was Paul Bastock. He had played against Wycombe in 1993 for Boston United. His career was already 5 years old at the point, having made his debut for Cambridge United in his late teens back in the 1988/89 season. He was one of a number of good keepers and characters around at that time in the Conference and went on to make 625 appearances for Boston over 13 years. He was back for his third spell at St Albans City and seeing him at the ripe old age of 43 bought a warm feeling. Not just because in these times of mercenaries who grab all they can take from footy whilst not giving as much back, here was a keeper in his 25th year of senior football still performing admirably. Plus the fact that I was still a schoolkid when I first saw him play, it made me feel young for once rather than feeling like an old git and wondering where all those years had gone to. 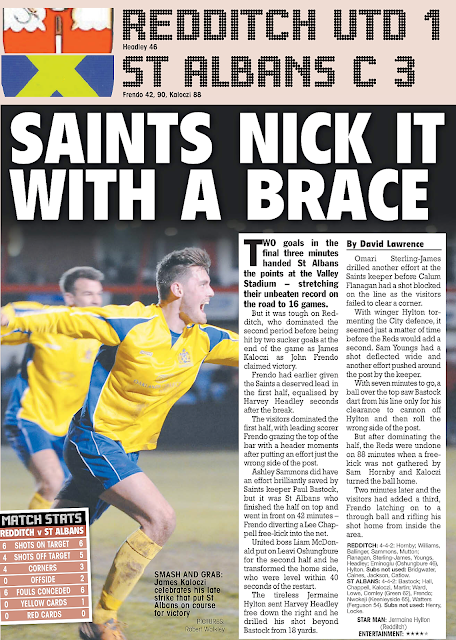 It was a decent game - the match report from the Non-League Paper is below. I had enjoyed another good day watching football and on the way home first listened to BBC WM to see what was happening in the local football scene. After BBC Radio Oxford it was Radio 5 for 606 with Robbie Savage. There was talk about the idiot Vincent Tan who is ruining Cardiff City at the moment and wants successful manager Malky Mackay to 'resign or be sacked'. Yet another example of foreign owners (after shennaigans at Blackburn & Hull) ruling roughshod over fans wishes and traditions of the game. I for one hope Mackay screws them for every penny he can, and apart from a madman who tried to defend his actions later on in the phone in, everyone that I have spoken to agreed with me. I dropped Anwar off at 6.30, getting home just before 7. This will probably be my last game before Christmas, but knowing me I will be tempted to sneak another in if I can. I hope all my friends and all that are reading this have a great Christmas and a happy new year when it comes around. 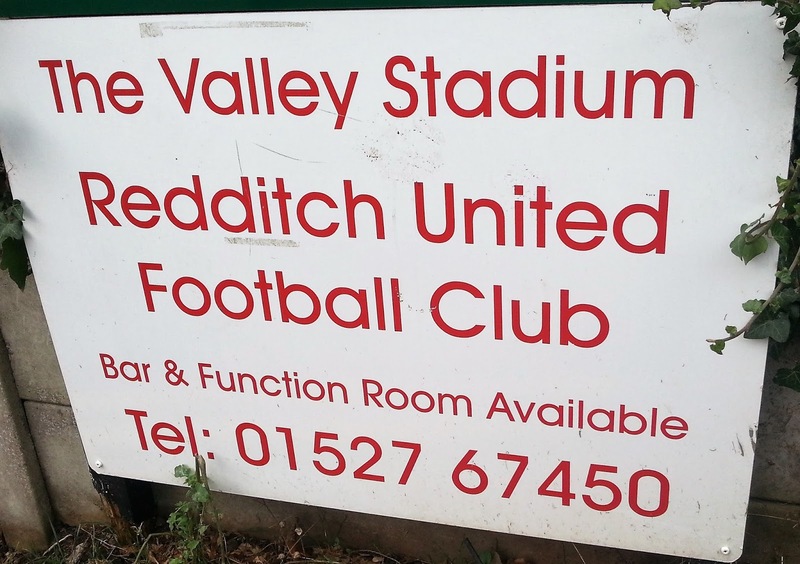 THE VALLEY STADIUM is a traditional non-league ground, with plenty of interesting features. But if the club has their way, they will be moving out soon with high maintenance costs and a bad pitch being the clubs main reasons for them wanting a move. It will be a shame as it is one of the more interesting grounds in non-league. The main stand is particularly interesting with a strange 2 tier design. 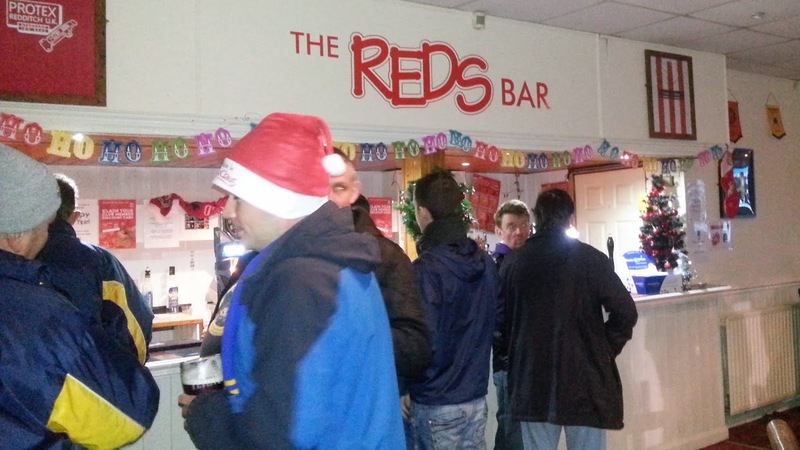 It also houses the bar and dressing rooms. Opposite is a covered terrace, whilst to the right is the same, except bigger and with a row of seats at the back to comply with ground grading regulations. The one remaining side had a temporary seated stand when I visited for pictures on a non-matchday back in their Conference North days, but now it is just open standing. The bar is excellent with a decent selection of drinks, and Sky TV too. 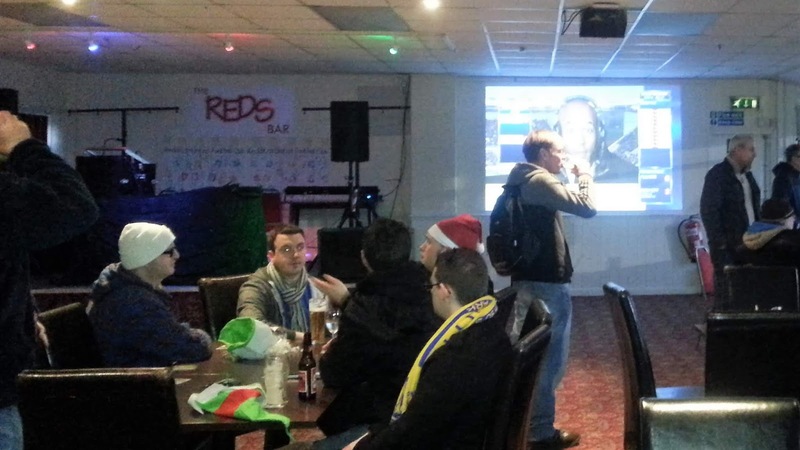 You can also watch the game from in here as it has views out onto the pitch. 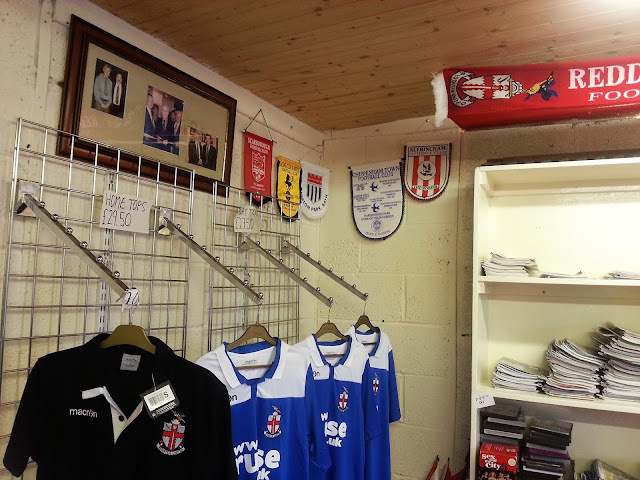 The club shop has a reasonable range of merchandise and old programmes too. The tea bar was decent. Despite not eating there I bought a Bovril and got a free mince pie thrown in, very nice and all in the festive spirit. The town centre is only 5-10 minutes away if you fancy a wider choice and have time to kill.